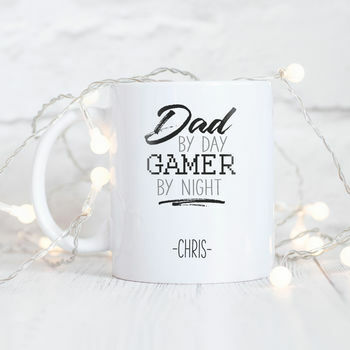 Beautiful personalised ceramic 'Dad by day, gamer by night' typography mug. This personalised 'Dad by day, gamer by night' typography mug makes the perfect gift for all dad's that love playing video games! The perfect gift for all occasions such as Father's Day, Christmas and Birthdays.